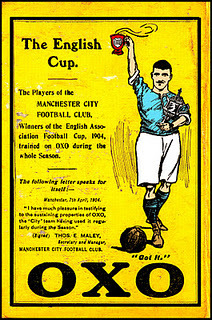 1894: City use Oxo to win the FA Cup! Another poster from 1904 describing the benefits of Oxo as used by the City team during the season. Billy Meredith is featured again holding the FA Cup, as well as a cup of Oxo. The original poster was in black and white and has been coloured by myself using Photoshop.